While a 16.5-pound benchrest gun is wonderfully stable on the bench, it’s not what you want in a field rifle. There is much to be said for a slim, light-weight, and easy-handling firearm when it comes to a walking varmint adventure. 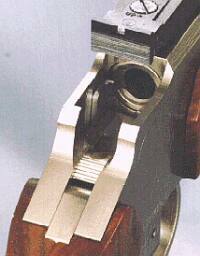 Eben Brown, who runs E. Arthur Brown Company, has created just such a rifle–the elegant Model 97D Falling Block. When chambered for the 6PPC cartridge it offers quarter-MOA accuracy in a splendidly portable package that tips the scales at just over six pounds without scope. Every serious gun aficionado should have at least one falling block in his collection. You don’t have to be a ‘Bench Rest Competitor’ to enjoy shooting one of the most accurate centerfire cartridges in the world, the 6mm PPC. With no complicated brass forming or finicky reloading processes, you can be shooting near half-inch groups right from the start and hone your skills to near quarter-inch groups by your second outing–at least that’s how it worked for me, and I’m NOT a good bench rest shooter! Developed by Louis Palmisano and Ferris Pindell, the 6PPC has reportedly won more bench rest accuracy competitions than any other cartridge. Easily made from Lapua 220 Russian brass, the 6mm PPC has a small primer and uniquely small flash hole that is credited for much of its inherent accuracy. The “short, fat” shape and nearly straight body contribute to efficient, consistent powder burning and stable chamber performance (it grips the chamber well during ignition). Full-length size, prime, charge with powder, and seat a bullet… sounds like what you do with any other cartridge, doesn’t it? In fact, the only difference with 6mm PPC is that it has to be fired once (fire-formed) to expand to its final shape and size. But even fire-forming shots produce exceptional accuracy. I shot several 3/4″ groups while fire-forming at 100 yards, with my best group at nearly half-inch–so the time spent fire-forming was wonderful! In the photo, the parent 220 Russian case is on the left, while the fire-formed 6PPC case is on the right. We dimensioned our 6mm PPC chamber reamer to cut a chamber that fits Lapua 220 Russian brass closely without neck-turning. Naturally we recommend you use the Lapua brass for best results. 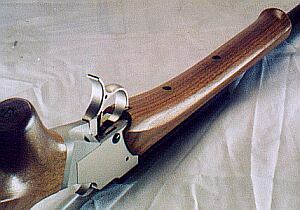 The following loads were worked up in a Model 97D Rifle with 24″ barrel chambered for 6mm PPC with the chamber neck reamed to .275″ to fit Lapua brass without neck-turning. Lapua 220 Russian brass was full-length sized and fire-formed to 6mm PPC using 65gr V-Max bullets, CCI BR4 primers, and 24.5gr of VV N135 powder. 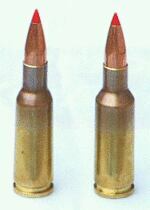 The following optimum loads were worked up with N135, 58gr and 65gr V-Max bullets, and CCI BR4s. Please Note: There really is no “standard” for 6mm PPC. It can be finicky. But once you find what works best for you, the cartridge performs superbly. The accuracy will astound you. The 97D was developed from the EABCO “BF” falling block silhouette pistols that have dominated world championships and set 500-meter distance records. In operation, the 97D falling block slides perpendicularly and closes the breech with absolutely zero camming leverage. This makes it a perfect test-bed to measure the chamber performance needed for hand-loading most other single-shot rifles accurately. This rifle was outfitted with a Swift 8-32X50mm Premier scope and Harris bipod. Back at the reloading bench, I worked up a load with the now fully shaped 6mm PPC brass. I full-length sized the brass, trimmed, and primed each case the same as I would with any other cartridge, and began loading. With the resultant load, I easily shot a 5-shot 1/4″ group–a personal best for me. Approx. Weight without Sights: 6-6.5 lbs. I’ve found that my maximum single-shot loads reach the same level of performance as bolt gun loads when I use one level slower burning powder type and proper chamber preparation. For example, when the VihtaVuori loading guide shows a maximum with VV N133, my best single shot load ends up being with the slower burning VV N135. Here’s the simplest way to proceed: Use a starting load from the loading guide and increase the powder charge until you detect some resistance to block movement with your thumb. Next, charge a case with that same amount of powder, tap it to settle, and look to see if the case is full to the base of the neck. If it’s not full, step up to the next slower-rated powder and repeat the load development process. There’s a powder burn rate chart for all brands of powder in the front of the current VihtaVuori Loading Guide. When you have the maximum load that will fill the case and still allow the 97D single-shot to open and eject freely after firing, you’re ready to shoot some groups! In the P.O. Ackley Handbook (Vol I), there’s a chapter on “Pressure” that dramatically illustrates the proper chamber performance of a cartridge. Ackley unscrewed a barrel one turn and fired the cartridge in a dry chamber. 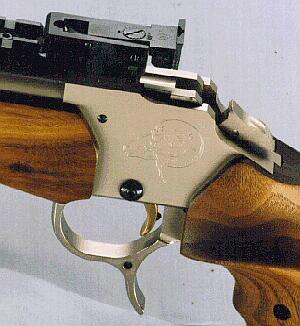 The cartridge head stayed flush with the barrel breech and did not drive backward into the bolt! This is the type of chamber performance that you want for the lowest amount of stress on your action and that consequently results in the best potential for accuracy. In the model 97D rifle you can check chamber performance easily. After firing a shot, see if you can press the block downward with only your thumb on the top of the block. If it moves freely, you’ve got good chamber performance. I use three pressure indicators when developing loads on the Model 97D. First I check the block with my thumb. Then I check to see if the cartridge sticks at all when ejecting. And finally, I check the primer for the excessive flattening that would indicate too much pressure. Generally, the hottest load that still allows the gun to open and eject freely ends up being my most accurate shooting load. It stands to reason that you can’t shoot any more accurately than you can see. The Swift 8-32X50mm Premier scope I used here has several features that contribute to super-accurate aiming. First, the 32X magnification (at full zoom) lets me see well enough to read the numbers on the Shoot-N-C targets. And at 32X the Swift scope reticle only covers up 1/8 inch of target at 100 yards. So, I was able to aim with 1/8″ precision from one shot to the next. Finally, the adjustable objective lens let me dial out any parallax error so that the repositioning of my eye behind the scope from one shot to the next did not change the aiming point. I love the 6mm PPC! It was easy to hand-load for the cartridge and it was easy to get excellent results. The group shot on this page was with the 65gr bullet and a rifling twist of 1:10. I usually recommend a 1:12 twist and the 58gr bullet because customers have reported superb accuracy (better groups than I can shoot). But the 5-shot ¼” group I shot with this set-up is my personal best ever–so naturally I’m thrilled! While it’s hard to beat the 6PPC’s accuracy in a Model 97D rifle, my company offers the rifle in over 50 chamberings, including .223 Rem, the new 204 Ruger, and all the popular .17-caliber varmint cartridges. While we do build fully customized rifles, we have combined the most popular components in our new $899 “Standard Model” 97D. Ordering a standard model saves both time and money. The 97D Standard features a blued 24″ chrome-moly barrel (chambered in .223, 30/30, or the 30/30-derived 6.5 BRM), French Gray receiver, anodized buttstock transition, 2-ring scope mount and swivel studs. Alternatively, a 97D can be customized with many different options, including stainless barrel, Benchrest-style fore-end, engraving, brass buttstock transition, ambidextrous stock, muzzle brake, special select wood, and a variety of deluxe wood finishes. Rifle report text and photos Copyright © 2010 Eben Brown All Rights Reserved. All other content Copyright © 2010, 6mmBR.com | AccurateShooter.com, All Rights Reserved. No reproduction of any content without advanced permission in writing. Topics: 97D action, E. Arthur Brown, falling block, Silhouette, single-shot, hunting, varmints, varminting, groundhog shooting, rifle accuracy, 6PPC, 22PPC, 220 Russian, 6mmBR, 6BR, 6 Dasher, .222 Remington, 17HMR, 17 Remington, 204 Ruger, 22 Hornet, .221 Fireball, 6.5mm, 7mm, Ackley Improved, stocks, Brown custom actions, stainless barrel, Encore, muzzle brake, reloading, powder selection, case forming, fire-forming, Lapua Brass and Hornady bullets, V-Max, Vihtavuori, N133, N135.